Not all networks are the same! If you are interested in transforming systems so that they are good for everyone, then you are probably helping people co-create a System Shifting Network. The colors represent diversity – you can make maps that show geography, type of organization the individual is part of, race/ethnicity, interests, etc. The lines represent relationships. You can draw maps where the lines represent different relationships: that the individuals know each other, have worked with each other, or want to work with each other. The network has a substantial core or center of diverse individuals who know each other or are only a few steps away from others. The grey dots represent people in the periphery, that is, only one or two people know that individual. People in the periphery are often resource people that can be drawn on as needed, or people from other networks. The periphery should have 3-5 times the number of people in the core. Here’s what makes a System Shifting Network more powerful in creating change than most types of networks. Groups of people in System Shifting Networks (SSN’s) are continually forming new collaborations to try to learn more about the system they are disrupting and the system they are shifting to. Often SSNs have dozens or even hundreds of these collaborative projects underway at any one time, and many people are in more than one project. Because of this overlap, innovations generated in one collaboration often quickly spread to many other collaborations. Think, for example, about the way the use of zoom.us videoconferencing has spread among people in networks. People in System Shifting Networks are continually bringing new people, especially those often under-represented, into their collaborations. These individuals often bring in new perspectives and make people challenge their assumptions, often resulting in much more effective projects. In these collaborative projects, people have to scramble to develop new skills and learn new ways of working together. People in these collaboratives work as peers, even though they may identify a coordinator. Everyone in the project learns how to organize and implement a project, and thus there are plenty of new network leaders capable to initiate new projects. So leadership is continually expanding. Projects are seen as experiments – a way to get more insight into the system they are shifting. They learn what works and do more of it. People in projects take time to share what they are learning with others in the network and in other networks so that everyone benefits from every project, whether it was a “failure” or a success. STAGE 1: Many networks start as scattered clusters among individuals. Often the relationships in these clusters are informal – people talk to each other in the grocery store and at their child’s soccer game . STAGE 2: Then some individual, organization or group decides to start the formation of an intentional network focused on a particular issue, problem, sector or geography. They become a network hub. They reach out to others they know are interested in the issue and find out about their needs and interests. 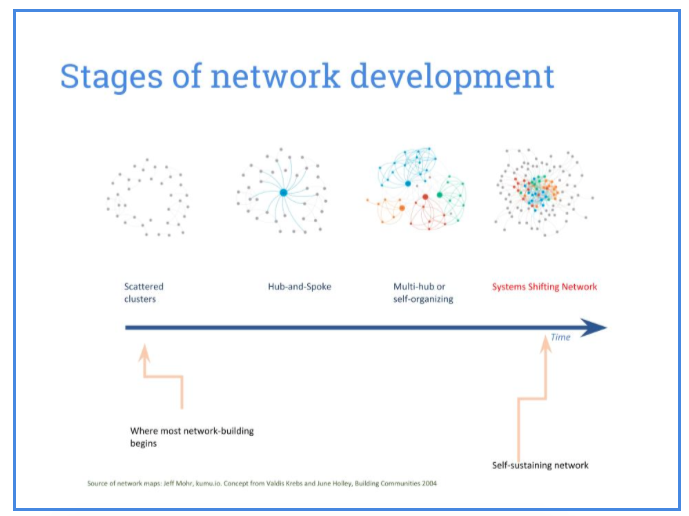 Often networks stay in this stage, and the hub broadcasts useful information to the interested individuals and has conferences and webinars so network participants can gain new information. However, if a network stays at this stage it loses many of the advantages of networks and will not be capable of changing a system. STAGE 3: The next stage moves the network to a self-organizing phase. With a lot of support (which we will go into in detail about in future blog posts), individuals or groups in the network start noticing some action that might make a difference and form a collaborative project. Sometimes a network does a system analysis and identifies leverage points and forms working groups to generate experiments in that area. STAGE 4: The final stage – a System Shifting Network – emerges when a substantial support structure – communications, learning, restructured money and resources and just-in-time tracking shared with participants – is developed. Projects get larger and have more impact. What stage is your network? Please share in the comments section below. This entry was posted in Blog, Network Mindset, Network Processes, Network Structure and Governance, Self-Organizing. Bookmark the permalink.